“There is no royal flower-strewn path to success. it is because I have been willing to work hard. 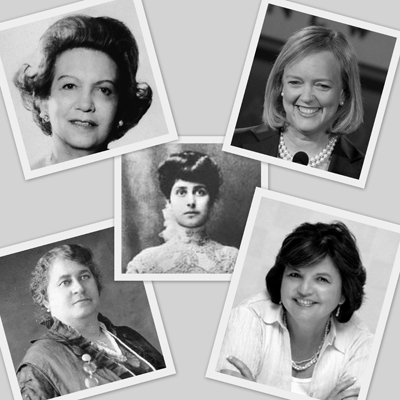 Women’s History Month has come to a close, but women continue to make history on a daily basis. 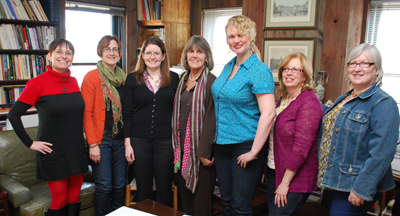 At NEW‘s last Meet & Munch women’s historian Barbara Joan Zeitz provided us with a list of inspirational business women. While Barbara generally focuses on unsung heroes in her books, she made an exception for this presentation and mentioned trailblazers who have been recognized in the business world. Nonetheless, a few of the women mentioned were new to me. Our attendees, ranging from business consultants to communicators to social media specialists were all keen on empowering women. 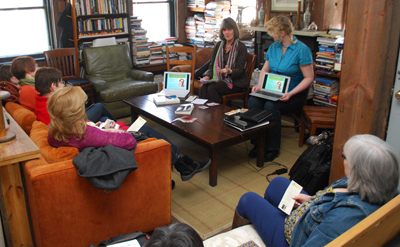 Barbara’s mission is to share women’s history so each woman can learn and own her own history. “We’re not competitors, we are compatriots. Madame C. J. Walker ‎ was one of the first female millionaires in U.S. History, founding a hair product business in the 1920s after losing her hair and then training other African American women to become ‘franchisees’ before franchising was a concept. She trained agents in South America and focused on teaching black women to be self-sufficient. Julia Morgan was the first female to graduate Berkeley with a civil engineering degree and the first female licensed architect in California. She rebuilt the Fairmont Hotel in 1906 and designed 700 buildings in her life time, including Hearst Castle. In spite of her status as one of the most distinguished women architects in America who pioneered the use of steel- reinforced concrete, Julia Morgan was listed as Hearst’s secretary, rather than the designer of his castle and the surrounding 127 acres. Muriel Siebert moved to New York in a used car with $500 in her pocket. She changed jobs three times because men earned more than her. When she applied with her initials rather than her full name she had more employment success. Upon applying for the New York Stock Exchange she was turned down by 9 sponsors, which put her in a catch-22 because the bank insisted she have a sponsor and the sponsors insisted she have a loan. She became the first woman on the New York Stock Exchange and subsequently the first female Superintendent of Banks in New York (an SOB, as she called it). She started a personal finance program for High School Students in New York, which became a model for nationwide programs. “If you find that you don’t like what you’re doing you can change it. you have to continue to do the same job if you’re not feeling satisfied. Lena Himmelstein-Bryant ‎ was widowed with a young child after 16 months of marriage to David Bryant. She designed maternity wear at a time when women were placed in seclusion. She sold out the day her ad was published. The letters in her name were transposed at a bank, and she didn’t correct it, thus becoming Lane Bryant. She moved on to full-figured women’s wear and was the first to offer employee benefits. Coco Chanel was placed in an orphanage at a young age who became a store clerk when she grew up. 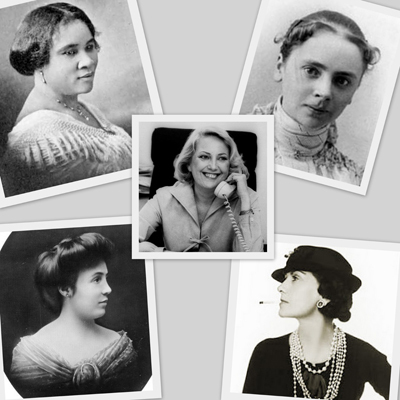 She built a fashion and perfume empire, took women out of corsets, and made slacks acceptable high fashion for women. She was fiercely independent and moved in elite circles where she networked very well. 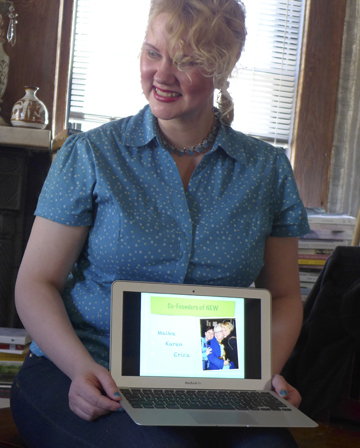 Barbara said she exemplifies the value of women and how to embrace your gender. Elizabeth Arden ‎ started her career as a nurse. She learned of a cream that treated burns and combined science and technology for beauty. Her first salon was opened in 1910 which expanded to a $20 million empire. She marched for women’s rights with 15,000 Suffragettes and was the first woman to be featured on the cover of time in 1946. Meg Whitman joined eBay reluctantly in 1998 when it had 30 employees. Her restructuring and management grew it to 15,000 employees and $8 billion in annual revenue by 2008. She was noted for redefining business principles by implementing procedures that steer and influence rather than control, focusing on conversing rather than commanding, and asking questions instead of giving answers. She was noted for saying that bottom line success comes from experimenting and failing rather than doing nothing when bold action is needed. Carrie Marcus Neiman was a fashion buyer with her brother for the Neiman Marcus store her husband owned. She brought ready to wear to the Dallas market and transformed it into a fashion capital. Maggie Lena Walker dreamed of owning a bank at a time when women couldn’t own property. She founded the first women-owned bank, St. Luke Penny Savings Bank, which after merging with two other banks in the 1930s continues to be the oldest continuously operated African American owned bank. Maria de Lourdes Sobrino came from a family of lawyers but had no interest in law school. She instead became a serial entrepreneur by starting a flower shop, which failed, a travel business that tanked during an economic downturn, imported crafts that didn’t prove lucrative, and opened a sandwich shop. In 1982 she put her savings into 300 cups of Gelatina, which became the multimillion dollar Lulu’s Desserts. As the owner of the fastest-growing Hispanic-owned business in the U.S., she served on the board of NAWBO-LA, Latina Style Magazine, D.C., Working Families for Wal-Mart. 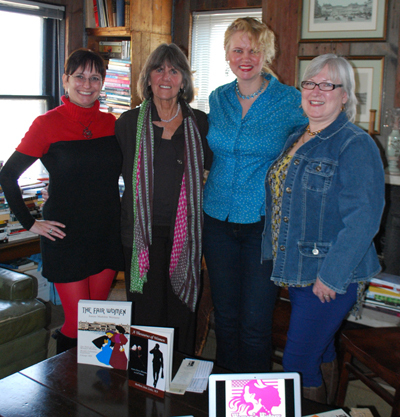 We chatted more about these women of Character, Courage, and Commitment and left encouraged and enlightened. 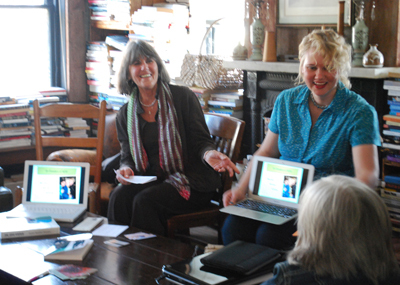 A Thesaurus of Women: From Cherry Blossoms to Cell Phones, is available on Amazon, via Barbara herself (who is working on her second book), and at our event host, Town House Books. 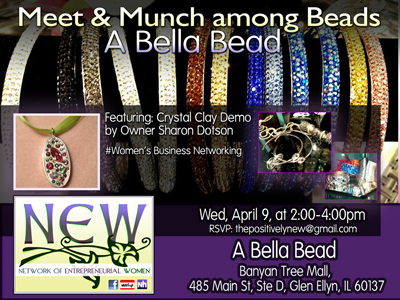 Join us for Meet & Munch among Beads at A Bella Bead next Wednesday, April 9 from 2 to 4 p.m. in Glen Ellyn. Open since October 2013, the store offers beading supplies for jewelry making, including loose beads, strand beads, clasps, findings, Swarovski crystals and lamp beads. Owner Sharon Dotson will demonstrate crystal clay, and we can peruse all her sparklies while we network. A Bella Bead Boutique is located at 485 Main Street, Banyan Tree Mall Unit D in Glen Ellyn, Il 60137. NEW – The Network of Entrepreneurial Women is a group of Chicagoland business women who are upgrading business networking with fun and creative events that inspire attendees to work together, refer each other and most of all cheer each other on as the membership succeeds. Events rotate around various suburbs on a semimonthly basis, usually the 2nd Wednesday and 4th Thursday of the month. 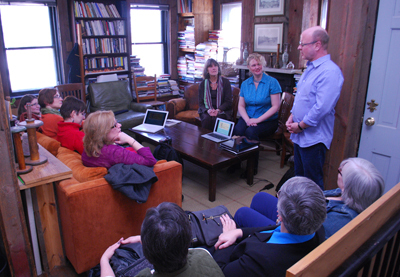 RSVP for our upcoming events at Meetup or Facebook. Networking photos courtesy NetworkHoncho.com, with the historic women’s headshots pulled from Google.